Wollongong Hospital (WH) implemented a program to optimise the pre-operative haemoglobin and iron stores of patients undergoing major elective colorectal, upper GIT and orthopaedic surgery. This will prevent avoidable blood transfusions and their complications, along the patient peri-operative journey. To decrease the rate of patients who are anaemic at the time of major surgery from 9.9% to 6.0% by July 2018. Receive consistent, easy to understand, information throughout the pre-operative journey. Participate in patient blood management (PBM) decisions. Receive timely treatment for anaemia and iron deficiency before major elective surgery. Avoid preventable transfusions and potential complications. Multidisciplinary collaboration between general practitioners (GPs), surgeons, anaesthetists, perioperative service nurses, and medical ambulatory care service nurses. Deliver timely multimodal PBM to optimise patients for surgery. Reduced costs related to avoidable transfusion (additional encounter cost; longer length of stay; higher rates of hospital acquired infections, and higher rates of readmission). Benchmarked case-mix and pathology data indicated that WH’s transfusion rate was 4.5 times their exemplar peer hospital’s rate in 2016.7 A retrospective audit of 223 WH major elective orthopaedic, upper gastrointestinal and colorectal surgery patients revealed that only 10% of patients were anaemic preoperatively, which is significantly lower than the claimed prevalence of preoperative anaemia in higher income countries (28.7%-30.4%) in the literature.8 However, 93.3% of the cohort was not screened for ID. Of those who were screened, 53% were diagnosed, or likely, iron deficient. Since it is possible to be iron deficient without anaemia, and inadequate iron stores or availability can limit postoperative erythropoiesis, WH’s high transfusion rate in major elective surgery patients could be partly attributable to a high incidence of undiagnosed and untreated ID. As such, this makes for a strong case to provide optimal preoperative anaemia and ID management. patients and their carers were not empowered with adequate information; or encouraged to collaborate with their healthcare providers. No system prompt for iron studies or ferritin. No local guideline for prompting optimal pre-operative PBM targets (including adequate iron stores) for major elective surgery. Written information provided to patients is very general and does not offer possible alternatives to perioperative PBM transfusion. No specific perioperative PBM care plan available to prompt staff to offer optimal PBM and involve patients in their plan of care. Low level of collaboration between the primary health network and perioperative service. Implementation – The project is currently being implemented. Retrospective pathology and patient file audit (n=210) of all major elective colorectal, upper GIT and orthopaedic procedures May-July 2018; and patient experience surveys (n=12) in August 2018 evaluated. A routine procedure for pre-operative ID screening was only implemented in July 2018. We expect to reach the target of 75% by the end of 2018, when the process becomes business as usual – which we expect to lower the perioperative rates of anaemia and transfusion. Transfusion rate remains stable: GIT 6.6% and Orthopaedic 3.8 in July 2018, however none were transfused outside of national Patient Blood Management guidelines. Additional benefits such as the potential for a decrease in average total encounter cost, and hospital acquired infections will be evaluated from case-mix data from the finance department and health roundtable (available in December 2018). Ongoing sponsorship is vital to the individual success of each solution – don’t forget to keep your sponsor well-briefed and engaged throughout the project. They won’t know how to help you unless you tell them what you need. Maintaining a strong commitment from the steering committee and project team members ensures a project stays on track. Doing the redesign project without backfill of substantive positions will disrupt project momentum - recruit a project officer and backfill before commencing the project. Partridge J, Harari D, Gossage J, et al. Anaemia in the older surgical patient: a review of prevalence, causes, implications and management. J R Soc Med. 2013 Jul;106(7):269-77. Clevenger B, Mallett SV, Klein AA, et al. Patient blood management to reduce surgical risk. Br J Surg. 2015 Oct; 102(11):1325-37. DOI: 10.1002/bjs.9898. Shander A, Van Aken, H, Colomina MJ, et al. Patient blood management in Europe. Br J Anaesth. 2012 Jul; 109(1) 55-68. DOI: 10.1093/bja/aes139. Kumar A, Auron M, Ereth M. Blood Management. Anaesth Clin. 2013; 31(2):316-21. Health Round Table. Patient Blood Management – Inpatient Analysis: Jan 2016-Dec 2016. Sydney: Health Round Table; 2017. 40p. Report No. : v01. Ferraris VA, Davenport DL, Saha SP, et al. Surgical outcomes and transfusion of minimal amounts of blood in the operating room. Arch Surg. 2012 Jan; 147(1)49-55. DOI: 10.1001/archsurg.2011.790. 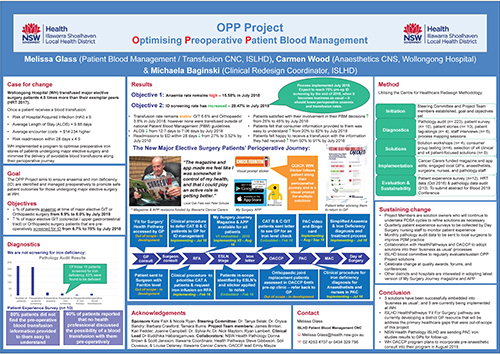 Glass M, Wood C. Wollongong Hospital Optimising Preoperative Patient Blood Management Diagnostics Report. Wollongong: Illawarra Shoalhaven Local Hospital District; 2016. 1p. Report No. : 1. National Blood Authority. Patient Blood Management Guidelines: Module 2 Perioperative. Canberra: NBA; 2012. Thomson A, Farmer S, Hofmann A, et al. Patient blood management – a new paradigm for transfusion medicine? ISBT Science Series 2009 Oct; 4(2)423–35.